“Save Our Cemeteries” explains the first Saint Louis Cemetery. The cemetery was established in 1789. New Orleans is the city where the spooky cemetery can be found. It is the oldest cemetery in New Orleans, and is said to be the spookiest. The Cemetery was divided into three different sections at first. There was a section for the Catholics, Non-Catholics, and Negros. The cemetery is not divided today, it has had reconstruction to make it bigger. The Cemetery contains some important people to the State of Louisiana. Maria Laveau, the famous voodoo queen is buried in the cemetery. The first black mayor of New Orleans Ernest Nathan Morial, is also buried here. The cemetery is very important because it has a lot of value to it. The tombs of the people buried there are fascinating. Most tombs are decorated with something, or has drawings on it to remember the person. In “Maria Laveau: A Nineteenth Century Voudou Priestess” Carolyn Long, explained the importance of Maria Laveau. She has one of the more famous tombs people enjoy looking at. A lot of people say they do not know whether she was actually in there or not, but they continue to visit it and decorate it. She usually has Mardi gras beads hanging from her tomb, along with other items on the ground. Maria Laveau was the queen of voodoo in the city of New Orleans. She was said to be a great voodoo practitioner, and anybody who practiced voodoo looked up to her. Many people go to Maria Laveau’s tomb to practice voodoo, the marking of the X, on her tomb is a sign of voodoo. People mark X’s on the tomb as a sign of respect to her. People have said they have heard the ghost of Maria Laveau, which would absolutely creep me out, but that makes Maria Laveau’s tomb interesting along with the X’s and items left on her tomb. 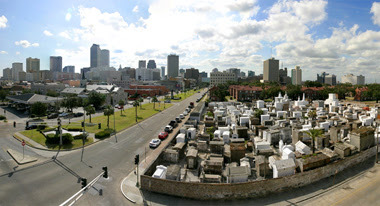 On the website French Quarter Phantoms, it gives great information about touring the first Saint Louis Cemetery. The tour of the cemetery looks very interesting. Personally, I would not take a tour to the cemetery because it would be scary and weird. I would encourage people who are interested in this type of information to take the tour. I think a lot of important information is given throughout the tours, and it would be an exciting adventurous trip. The tour is centered to take people throughout the entire cemetery. It is about one mile and it lasts for two hours. There are a lot of different tombs to look at. There are plaques located on some of the tombs to tell their accomplishments, and how they were significant to Louisiana. A tour would be helpful if you wanted to know about the first Saint Louis Cemetery because you could have your own personal experience. On the website, Find A Grave there is an article explaining Ernest Morial. Ernest Morial was the first African American mayor of New Orleans. He was also a leading civil rights advocate. Ernest Morial created black history by becoming the first African American mayor of New Orleans. Becoming the mayor may have encouraged other African American males to become successful. Once he became mayor, African Americans probably looked at him as a role model. Ernest Morial, also spoke up as a leader, by becoming a leading civil rights advocate. Which means he wanted equal opportunity for minority groups. He was fighting for everybody to have equal rights, and I would say he was successful along with others. Today, we all have equal opportunity to do what we want, and speak our opinion. Ernest Morial was initially buried in the first Saint Louis Cemetery, but for spacing issues his tomb was moved. The first Saint Louis Cemetery is not only popular because of voodoo queens, but for individuals who created a way for equal rights. In the article, “The Spirit Of New Orleans Will Haunt You” by Tanya Wragg. She explains why New Orleans is portrayed as spooky. The streets of New Orleans is said to have had its legends of vampires, witches, and voodoo priestesses wandering them. The city of New Orleans has a various selection of spooky tours. There is a ghost expedition bus ride, which is a tour given to investigate paranormal activity. I think the tour would be pretty cool, but scary. The tour is said to be intense, because a person must be mentally, emotionally, and physically ready to experience a physiologically experience. They say this because spirits can mess with peoples mind. People may start to see ghost, or think they are hearing ghost after they have been on the tour. In my opinion, that could drive a person insane. New Orleans still has an original plantation, which can still be visited on a tour. The tour takes people over the Mississippi River, directly to the Laura Plantation. Visiting a plantation would be scary to me, because I think spirits sit at plantations. I think spirits sit at plantations because the plantation was their home. New Orleans has an abundance of spooky things, along with the Saint Louis Cemetery tour. The tours defiantly portray New Orleans as spooky. In this video, the LaLaurie mansion is explained. This portrays more about why New Orleans is considered spooky and haunted. “America’s Most Haunted: French Quarter, New Orleans (Halloween 2012)”https://www.youtube.com/watch?v=4Zg3lbHge-Q. 16 Oct. 2016. “Ernest Nathan Dutch Morial.” Find A Grave. http://www.findagrave.com/cgi-bin/fg.cgi?page=gr&GSln=morial&GSfn=ernest+&GSiman=1&GScid=643477&GRid=147114913&. 16 Oct. 2016. Long, Carolyn. “Maria Laveau: A Nineteenth-Century Voudou Priestess.” Louisiana History: The Journal of the Louisiana Historical Association. Web. 92-262, 2005. “St. Louis # 1 Cemetery Walking Tour.” French Quarter Phantom Ghost Tours. https://www.frenchquarterphantoms.com/cemetery-tour. 7 Oct. 2016. “ST. Louis Cemetery No. 1.” Save Our Cemeteries. http://www.saveourcemeteries.org/st-louis-cemetery-no-1/. 16 Oct. 2016. Wragg, Tanya. “The Spirit Of New Orleans Will Haunt You.” Hispanic 18.5 (2005): 64-65. Academic Search Premier. Web. 16 Oct. 2016.